Sweden’s Icehotel has revealed plans for a permanent sub-zero ice experience – including bar, art gallery and suites for overnight stays – available 365 days of the year. Like every winter for the past 26 years, construction of the forth-coming Icehotel is about to take off in Jukkasjärvi, Swedish Lapland. The ice from the Torne River is transformed to art sculptures and architecture that is set to attract thousands of visitors before it melts away in spring. But this winter might be the end of an era. The team behind the hotel announce plans to create a sustainable addition to the iconic Icehotel that covers 1,200 square meters and includes some 20 suites, a bar and a gallery. The sketches reveal an architecturally sleek building, combining the hotel’s smooth ceiling arch design with traditional methods and modern sustainable energy. Using the near constant daylight that the region above the Arctic Circle is blessed with through the warmer months of the year, the building is planned to run solely on solar power during the summer months. In winter, the new addition will form part of the classic Icehotel, which is about three times its size. “This ground-breaking initiative lets our guests decide whether they want to combine Icehotel with dog sledding and northern lights, or hiking under the midnight sun. “It just lets us meet the desires of our clients in a way whole new way,” said Icehotel founder Yngve Bergqvist. The idea to create an ice experience available year-round is not new – it’s been brewing in the company for years, but it’s not until recently that technological advancements in sustainable energy renders it achievable. Swedish solar power pioneers Solkompaniet are partners in the project. “It’s inspiring and fun to be part of an initiative that takes place well above the Arctic Circle. “The midnight sun offers unique conditions for producing electricity using solar power, as it allows us to generate power throughout the night,” added Jon Malmsten, advisor general at Solkompaniet. The new ice experience is projected to open in December 2016, granted the project finds investors to join the partnership. “We’ve created many temporary ice experiences in the past, and we’ve seen an increasing interest for visiting Icehotel not just in winter. 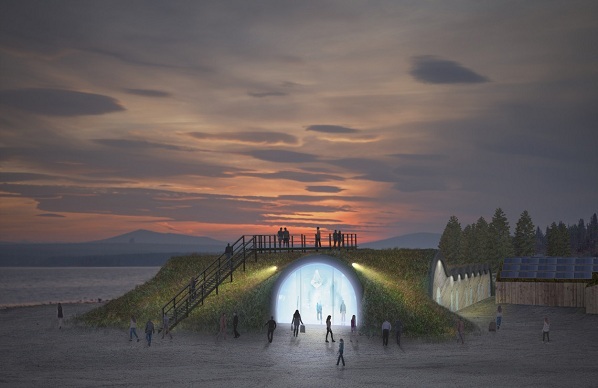 “Every summer we have international visitors who arrive in Jukkasjärvi and ask us where they can see Icehotel – I look forward to being able to point it out to them,” concluded Bergqvist.